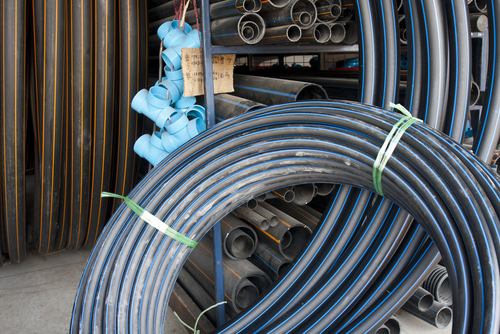 When discussing pipe, often we tend to describe it based on what kind of material it is (i.e. : PVC, HDPE). However, describing it this way fails to properly give an idea of what kind of performance one can expect out of it. Hence, describing the pipe stiffness is a viable solution to at least somewhat gain an idea of how the pipe will perform. Pipe stiffness involves the measuring of the load necessary to deflect an unsupported pipe a distance equal to about five percent of the pipe diameter at a specific temperature and at a prescribed loading rate. If a pipe’s stiffness is rated high, it is better able to withstand and resist deformation when it is being handled or installed. However, it may have little impact on performance after the installation has completed. Having a grasp of pipe stiffness is useful, but its relevance is often overstated. There tends to be a misconception that if a pipe has a higher stiffness, it has better load capacity than one with less stiffness. However, pipes with lower measured stiffness can still carry higher cover depths than similar pipes with greater stiffness.